You might think of your tires as fixed, unchanging vehicle components, but they’re actually some of the more “alive” elements of your vehicle. Tire tread is always wearing and evolving as the miles accumulate, but the tire tread compound also changes according to season, temperature, and road conditions. Additionally, the relationship between the tire tread and road surface is far more complex, and much more of an ongoing interaction, than you might initially think. Unfortunately, the tread features that give tires their critical pliability and interactivity characteristics are also the organic materials that are subject to deterioration. Tire tread (compound) deterioration is an automotive fact of life. However, the rate of tire deterioration can be slowed by understanding the environmental causes of dry rotting and cracking, and doing your best to avoid them. Once you understand that tires aren’t impervious to environmental influence, prolonging their life is pretty intuitive. In general, the more you can avoid subjecting your tires to environmental elements, the more tire life you can expect. UV exposure and oxygen are major degradation factors. Try to avoid exposing your tires to direct sunlight, or keeping them outdoors in any conditions (dry or wet) for extended periods of time. Somewhat counter-intuitively, keeping tires stationary, especially parked (with full vehicle load) in one position accelerates the aging and drying out process. Tires are engineered to be used, with the tire compound resins responding as intended to movement and activity, and actually working to protect the rubber. If you reside in the land of four seasons, there may not be much you can do to prevent it, but large temperature fluctuations don't do your tires any favors. Think of your tires as suffering through the temperature swings, just like the roads do in the northern United States. After so many seasons, the tires inevitably begin to resemble the roads! They may make your tires look good, but some tire cleaning products can actually speed up the degradation process, and shorten the lifespan of your tires. How long will tires last before dry rotting and cracking? We wish we could tell you that a certain amount of tire life is guaranteed, but that simply isn't the case. The quantity of exposure to the elements detailed above, along with many other factors, will determine just how much life you can get out of your tires. In general, ten years of age is considered the cut-off point for just about any set of tires. At ten years of age, even if tires are not showing signs of dry rotting and cracking, the tire tread compound has likely expired and lost effectiveness. Wondering how old your tires are? See easy instructions on how to determine the age of your tires. 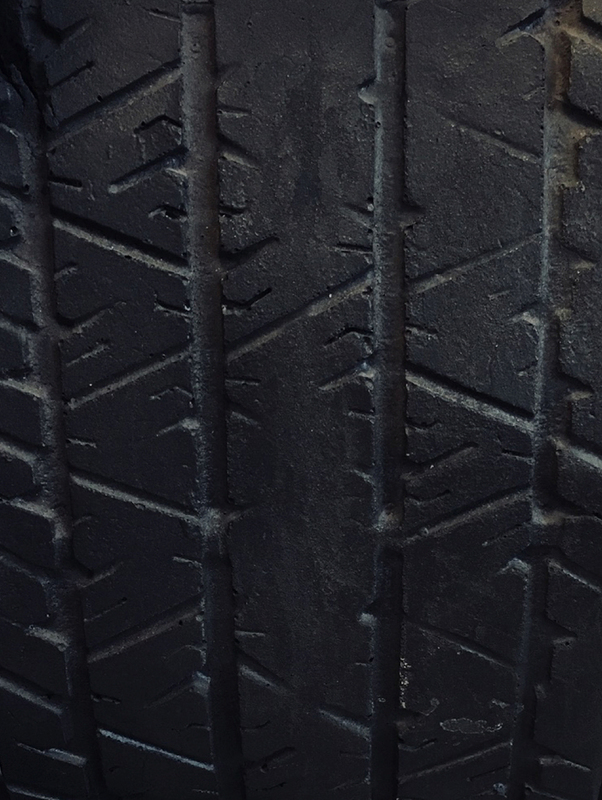 Recognize that cracking and dry rotting are signs of overall tire tread deterioration. This visible tread deterioration is a clear indication that the crucial tread compound and resins, which contribute in a fundamental way to proper road surface interaction, are no longer effective. Remember that the bar shouldn’t be whether a tire can successfully roll without catastrophic structural failure, but whether the tire still has necessary characteristics to provide optimum traction. If you see visible signs that tires are dried out, it's time to get a new set. There’s no way (oils, lubricants, prayer, or other) to renew a tire’s life. Don't push it if your tires are cracking and dried out. Keep you and yours, and everyone else on the road, safer by getting a new set. Find out why it’s a good idea to get an alignment now and then – and how much it’ll cost you. Stuff happens - empty gas tank, flat tire, alien abduction. But with this checklist, you'll be ready for all of it. This simple task can keep you safe on the road, save you money, and keep your warranty valid.